XMLSpy® abstracts away the complexity of working with XML-based technologies through its intuitive user interface and rich variety of editing views and options. Five synchronized editing views allow you to work with any XML technology in a way that best suits the complexity of the document and your preferences, for instance, if you prefer to develop in a text view, graphical view, or switch back and forth between the two. The intelligent editing features of XMLSpy® support auto completion, context sensitive syntax help, entry helpers, syntax coloring, and more to aid you in creating valid XML documents. 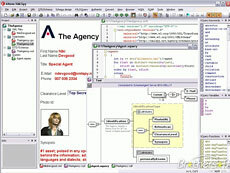 The XMLSpy views and intelligent editing functions are designed to make working with documents as easy as possible. When working with XML is easy, productivity increases, saving money and decreasing time-to-market for your applications.